The new building wants to assume the park – sort of – and this I fear will take it, de facto, out of the public domain. There is something about a park where you feel free to sit, sleep, just be there with no thought to surrounding anything. Public park is the phrase. If you take the short road out between the park and the building site, and they want to, then the park becomes sort of part of the west side of the new building, its front yard space, and more so as they change it greatly to be “modern” in the company of the hip “modern” building. Of course this is the Bullit Foundation, and they get high marks for enviro. issues – but – they are building a rental office space building. Their staff will be housed, the rest of the space rented. Landlords they will be in the classic sense. There is no housing in the new building, which was talked about at first. Offices for commercial tenants who can pay top dollar rent…. not a community center … not a charity. I love this little park, and the trees are awesome. Is it Seattle’s first pocket park? Why change it? Leave some history. Totally agree! Keep the park a public space as it is now. Do not allow it to become part of the new building by closing the existing street. I agree with you that it should remain a public park, but come on…it’s a crappy park right now. When have you seen anybody using it other than homeless people camping out? I’ve always thought it was the textbook example of a failed park–it’s there, but no one wants to use it. It has wonderful trees, but they also block out the sun so it is useless as a sunny hangout. The main problem is that it has no focal point. A patch of grass is boring, there needs to be a statue or a fountain and some short paths crossing the site. I think anything that comes out of this design workshop will be better than what is there now. I thought that large trees that weren’t in danger of falling were protected in this city, at least on private property. Wasn’t there some brouhaha about people having to apply to remove large trees from their own property? And now somebody wants to remove seemingly healthy trees from a PUBLIC park? There is a need for a better plan for the space. BUT, it is small, tiny, and will never more that a stopping space, a slice of green, yes, site for an art piece. And the retired, looking raggy, and the unemployed, looking raggy – are OK park users. At one time an AIDS memorial was planned for that site – perhaps that idea should be back in focus. Admittedly, I was not incredibly amped for the departure of the building that now houses the Men’s Room for an experiment in luxury green building. My assumption is that the park is not going anywhere, and if anything is done to the park it will only be to make the park more accessible and encourage use. I just want to clarify that there have been no suggestions of this park being anything but public. The City of Seattle owns it and is the only body able to enact actual changes, as well as determine a funding plan. In this case, the adjacent property owner has simply displayed interest in better utilizing the space and through SU has completed a private study of what the park was, is, and could be. No private organization has committed to any funding either. It should also be clear that there are no specific proposals for this project (ie. closing 15th or removing the trees). As noted above with the various teams, this study is simply a preliminary overview that encompasses many aspects of the park project. Again, as this is City-owned land, any actual proposal would have to be developed in conjunction with Parks, through the typical public process. I’m all up for getting a nicer park in the city, but I’m afraid this is not the “park” we should be putting out money into. Volunteer Park (and specifically the conservatory) is often frequented by every day people, families and sports groups. This “park” is just a place for the bums to nap. I have a friend who lives across the street and I have sooooo many photos of bums just hanging out there, doing drugs and peeing in his bushes. Again, I love parks, but this will just end up like several parks downtown that no normal person seeks out. Josh – you really can’t counter all the talk in all the meetings. They want the street vacated, have been plain in that demand. They mean to change the park and integrate it into their “plan’ which is beneficial to their close by commercial building development site. Who said title will change for the park? Use, image, layout, invitation and purpose will change. It is smart enchroachment, all the while saying “green” over and over. By the way, the present system of watering those trees must work really well …. hmmmmm …. so what is all that spin about??? The only real green, without a roof garden near, will be the decades old little park with the movie set plane trees, a dozen or so – ironic. $$$$ – too late, cash strapped Parks Dept. has given them the amazing amount of $650,000.00 for some facet of this park make over. Did you hear Parks Dept.? If your concern is about “bums” napping in the park, then you are mistaken. In fact, the park as it stands now is so ineffective as a public space that virtually nobody, including the homeless, stop to use this space. Additionally, I see nothing wrong with a PUBLIC space being used by any member of the PUBLIC. It is possible that you are mistaken about the public place of which we speak. You mention having pictures of “bums” peeing in the bushes. Unfortunately, there is not a single bush on the premises. 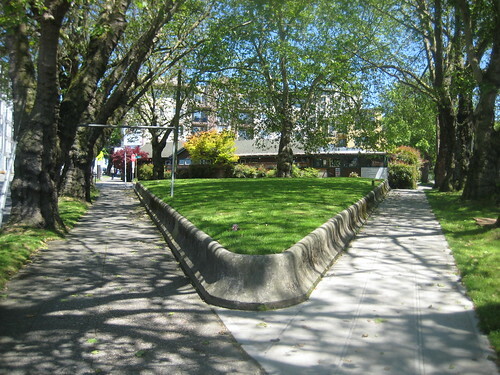 This park is located at the intersections of 15th, Madison, and E. Pike Street. We can all appreciate a citizen engaged enough to respond to a blog about a public space that we all share; for that we thank you. Considering the fact that both Volunteer Park and the Conservatory are already frequented by “normal people,” why wouldn’t we spruce up this place, make it accessible, and realize the community that can be found in a pocket park, normal people or not? Thanks for all of the infromation! Correct, there are no bushes in the park, but there are across the street at his house and the bums from the park wake up from their drunken stupor in the park and then pee/poop in his bushes, then head back to the park for a nap. I’ll tell you why not. Because this park, and its odd shape and location next to a busy road will not be frequented by “normal” people because it will be overrun with druggies! And YES, I do have many photos. I was just at his house an hour ago and after the heavy downpour let out the bums came out as well. I don’t care if you don’t believe me. And yes, to clarify, I’d rather build parks for the every day person and NOT for the Druggies. Mike with Curls: It is incredibly frustrating when you fling around these accusations that have absolutely no basis in reality. For the sake of keeping these comment threads valuable, I sincerely ask you to do a little research before posting the things you do. First of all, this project has received absolutely no public dollars. The application request that Bullitt put in for $650,000 was one of a whole host of project proposals and funding for those isn’t even close to being doled out. A process of Project Funding Recommendations will go on well into 2011. What’s more, the preliminary recommendations I have seen did not put this project near the top. Also, having gone to just as many meetings as you have about this project (if not more) I think your claim that “they want the street vacated, have been plain in that demand.” is just absurd. If anything I have heard some community support for this idea but far from any solid ideas from the project team except “make it better”. My take away has been that one of the main reasons the developers are even suggesting improvements to the public realm is to gain community support and excitement about their project (sure, a private benefit to them). So having some secret agenda seems utterly counter-productive. Sure, improving the street and the little park would probably be good for the building’s publicity and property value, but the idea that the use of these spaces would be limited to the public is simply not true. The city is not selling this land and does not have any plans to do so, period. I also just don’t understand the tone of your post. Why would you complain that private institutions are spending resources that would otherwise have to be funded by public dollars? Also, as a fellow neighborhood activist, why are you so negative towards a neighborhood developer who seems to truly want to integrate into the community? Would you rather they construct a project that is completely internal, spending their money instead on private gardens and courtyards so that the workers never have to step foot outside the campus? The bums who nap in that park during the day do more than pee in the bushes of the apartment building across the street. I’ve seen them pulling their pants down and taking a big dump against the side of the building in broad daylight more times than I care to remember! Monday I will sort the money issues out, right from the city. Every proposal so far floated about this building has the street vacated. Why is raising questions seen as negative? Is it not true they are creating rental space? Is it not true there could be a sense of the park belonging to the building tenants instead of the public, whomever that might be, and some real control over the park exerted by the building owners/ tenants vs. standard doctrinaire “public space” ….? My concern is with the park and trees. You notice others share the concerns. And I do hope some money is spent pruning and maintaining the trees better, and not wanting to be negative, but building a very green building in Seattle is hardly novel…. the spotlight is here because of the commercial aspect, prime location, and some degrees better on a certification standard. But then, it is the Bullit Foundation …. and it seems public monies, grants, are going to the project as well. By the way – ascribing motive – is hardly conspiracy echo. Highly paid folks are working on protecting a many millions investment here, is there potential conflict with public interest? I think it is worth talking about more before the project is all finished and fait accompli. BummerDude has no idea what he’s talking about. Maybe we should make some videos of the bums pooping in the bushes and post it on the net. But that only works if you have shame, and these druggie/bums have no shame. No, — — — , trying to forestall a problem. As you must know, the park in its current form has a wall approximately two feet high surrounding it on all sides. My guess would be that this has a lot to do with the fact that people do not pass through the park, leaving it an empty space that people more often walk around than through. Now I am not actually writing to express my own opinions about what should happen to this park. In fact, I appreciate the conversation that you have brought about the street vacation, which I think has some benefits as well as some detriments for the community. However, I would like to examine your concern about “a sense of the park belonging to the building tenants instead of the public.” Would it not make sense to allow Bullitt to partner with the city and infuse some funds into this park? Aside from being inaccessible, there are no amenities in the park (trashcans, seating, etc.). The amenities are all gone, I would assume, because of the cost of maintenance: you have to pay someone to take out the trash, pay someone to clear graffiti from the benches, etc. If the park were given funding from the Bullitt foundation, and was made into a nicer public space, I think that you are right to assume that it would be frequented by people that will be working in the new building. I don’t think, however, that they will be all that distinguishable from anyone else in the community. I am excited to see more people enjoy this space, employees or not. I think that if funding were granted and the park was made more comfortable, you would like to see that also. As it stands now, the space is ineffective and deserves to be made into a space that people will frequent. Thanks for all of the information, great blog by the way. I am a bit confused by everyone’s discussion… Is there actually funding from the parks for any plan that may be devised for the park by point 32 or from the bullit foundation? Are then any actual plans to do any form of developing? The park is in need of amenities of some sort and has some accessibility issues that need to be worked out. It seems that having an office space next to the park might encourage more use, and if the park is used more it may not be such an appealing spot for the ‘bums’ that may be there. As far as I understand, though, there are no plans for this park as of yet…? Chris Rogers and the Bullit Family? There should be enough $$$ there to do what they need if there are improvements that need to be made they can afford them and do their part for their community with their funds, the park is fine now we can use park funds in other areas throughout the city.